One of the premiere private event destinations in the west valley, the Colonnade is an elegant 3,300 square foot indoor event and meeting space fit for any occasion. 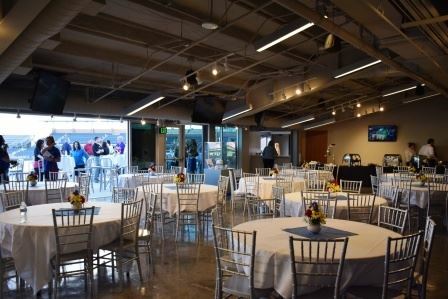 Nestled alongside the baseball diamond inside Peoria Stadium, the Colonnade is outfitted with the modern amenities necessary for seminars, conferences, weddings and private parties of any nature. Air conditioning, audio/visual connectivity, presentation screens, ambiance lighting, catering services, full bar, private restrooms and a private patio all complement this unique experience. Of course, there’s more! The Colonnade is available for event bookings all year-round and also includes full service catering that may be customized to the needs and budget of any event. To complete your event, offerings range from off the grill breakfasts to smokehouse barbeque luncheons and chef-carved prime rib premier dinner buffets; plus hors d’oeuvres, á la carte and dessert choices for every palate. Special diet requests may be accommodated as well. On top of that, for those events seeking a social entertaining environment, house and premium alcohol services for beer, wine and spirits are offered for both host and cash bars.